カンガ物語Show posts in this category. 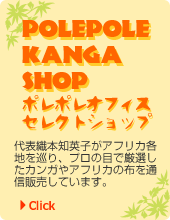 恋するカンガShow posts in this category. これまでのイベントShow posts in this category. イベントレポートShow posts in this category. Copyright © CHIEKO ORIMOTO All Rights Reserved. No Reproduction or Republication without Written Permission.